Features: Stainless steel front and sides with a range match profile. Individually controlled 15,000 BTU's/hr (4 kW) stainless steel burners located every 6" (152). Removable reinforced cast iron radiants prevent clogging of burners and provide even heat distribution. 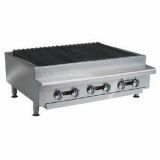 Each 3" x 22" (76 x 559) top grate blade has a cast-in grease trough that allows excess fat to flow to the front grease gutter minimizing flare-up and provides attractive char-broiler markings. Includes 4" (102) adjustable legs. S/S Wall Shelf, 48" x 12"
Omcan M60B 60 Quart Mixer.